RU students volunteered at the Goshen Valley Boys Ranch to make sure they had a great spring break. Pictured, from left, are: Emilee Riley, Carlos Guzman, Ryan Thompson, Justin Wells, Abel Ramirez, Elisha Roland, Andrew Tetrault, Stephen Young, Cameron Eison, Nick Medici and Deborah Dahn. Reinhardt students spent time with the young men from Goshen Valley Boys Ranch during the Cherokee County School District Spring Break. They had lunch with them and planned a day full of flag football, kickball and fishing. Pictured, from left, are: Emilee Riley, Carlos Guzman, Ryan Thompson, Justin Wells, Abel Ramirez, Elisha Roland, Andrew Tetrault, Stephen Young, Cameron Eison, Nick Medici and Deborah Dahn. 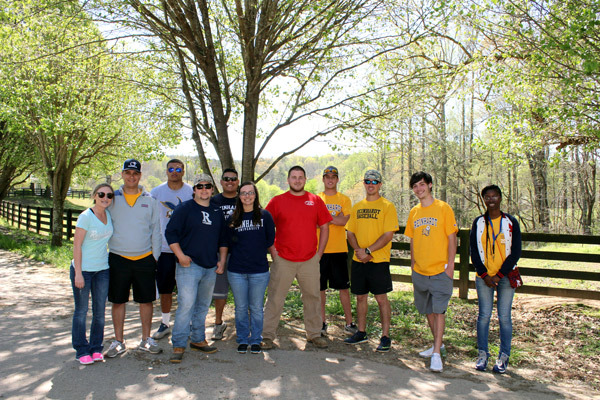 Reinhardt Baseball provided tickets for the young men at the Goshen Valley Boys Ranch to attend the game against Faulkner University on April 4. The boys were allowed to go onto the field and participate in pre-game practice. Students in Tina Boosel’s business class put service-learning to work this semester as they made boys at the Goshen Valley Boys Ranch feel like a part of the family. The Project Management Class used their newly found skills to plan a field day during spring break for the 47 boys at Goshen Valley Ranch. The Ranch is the flagship program on the Goshen Valley Foundation established by the blend family. It provides a home to boys ages 11-18 living in the Georgia foster care system. The Ranch currently is run by Zach Blend, whose parents, John and Connie Blend, purchased the property from Newt and Lillian Collins Kline. Their family had owned the property in the Salacoa Valley for 140 years. Zach Blend, executive director of Goshen Valley Boys Ranch, said having the interaction with college students provided motivation and inspiration for the boys. Thanks to the RU Baseball Program, young men at the Goshen Valley Boys Ranch got to enjoy an evening of baseball as the Eagles beat Faulkner University. “One of the things our young men lack in life due to the circumstances they have faced is exposure,” he said. 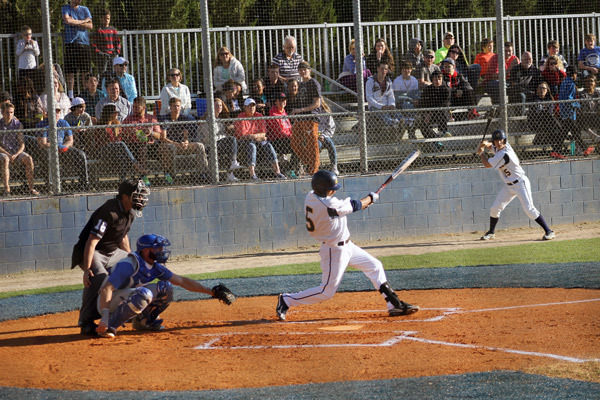 “For our boys collectively to have the opportunity to connect with college students who are active, engaged, motivated and friendly, all of that sets a positive reflection in the eyes of our boys about what it means to attend college and be associated with Reinhardt,” Blend said. During spring break for the Cherokee County School District, the students spent the day fishing and playing flag football and kickball. They also brought lunch and treat bags. Students from Boosel’s class also took up collections around campus for toiletry items, T-shirts and socks for the boys. “The class left the experience realizing that with some planning, communications, and a servant heart that a class of 11 students can make an impact in the community,” Boosel said. The experience was not over for the Goshen boys once Boosel’s students left the property. Thanks to the Reinhardt Baseball program, which donated tickets for the boys to attend a game and enjoy concessions, the boys were able to watch the Eagles defeat Faulkner University 6-5. Blend said Coach Kevin Howard and the players took time before the game and made the young men feel welcome. Blend said, as a staff member, it meant the world to him for the Reinhardt students and the Reinhardt players and Coach Howard to take time for the young men before the game. In addition to the field day and baseball game, the boys at Goshen Valley were able to enjoy Zaxby’s during the week of spring break thanks to local Zaxby’s stores owner and RU Board of Trustees member Fred Weir.